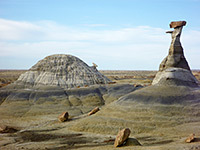 All around the relatively well-known Bisti and De-Na-Zin wildernesses in northwest New Mexico are other badland areas containing the same fantastic eroded rocks and colorful, undulating clay hills, some also with an official designation, like Ah-Shi-Sle-Pah, others unnamed. 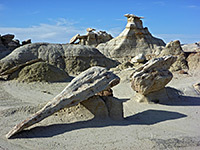 An example of the latter is a few miles southeast of the tiny settlement of Burnham, towards the east edge of the Navajo Indian Reservation; here the photogenic formations extend for several miles along an escarpment at the edge of a low plateau, bordering the south side of Brimhall Wash, a minor drainage that leads to the Chaco River a little way downstream. The best area is quite compact, maybe one mile across, and the badlands are easily explored by walking down from a gravel road on the plateau. 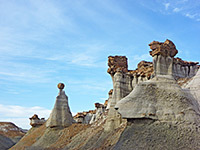 Like other badland regions in this part of New Mexico (the San Juan Basin), the hoodoos and mounds are mixed with pieces of petrified wood, here including upright stumps several feet high. The nearest major road to the Burnham Badlands is BIA 5, the only paved route linking US 491 and NM 371 for 70 miles, between US 64 in the north and BIA 9 further south. 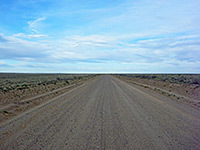 The road crosses rolling, grassy, treeless plains, uninhabited apart from occasional Navajo houses. A lesser road (5080) forks south at Burnham, paved as far as the local chapter house and then unpaved, but with a very flat, smooth surface. The badlands are visible off to the east, before the road climbs to the plateau and is then straight and level for the next 10 miles to Highway 371, again passing isolated houses at first but then through completely empty lands for the final few miles. The suggested parking spot is 4.3 miles from Burnham at the north end of a very short side track next to an oil well, a point right at the edge of the plateau, out of sight of any houses and so also a good potential camping spot. As this area lies on Navajo land, a permit is required both for hiking and camping, obtainable from the Fish & Wildlife Office at Window Rock. Just below the plateau rim, the upper section of the badlands is composed of smooth hills, ochre, black or brown in color, much like Ah-Shi-Sle-Pah. Below these is a whitish layer, followed by a red band where the soft hills mingle with outcrops of harder, yellow-brown sandstone, which forms the largest hoodoos. 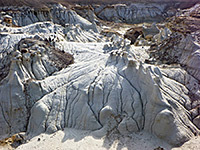 Other nearby locations have more resistant white strata, weathered into smaller hoodoos, and this layer becomes quite extensive at lower elevations. 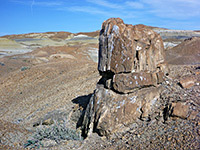 Petrified wood is found in scattered places, not very numerous but including some vertical stumps, also generally at lower regions, where the relief is less and the hills give way to open plains. The badlands are crossed by shallow, branched dry washes, starting at small sinkholes in the upper hills, and coalescing to three larger drainages that join Brimhall Wash. Hoodoos occur all over the badlands, in a band three miles wide, but they are not particularly plentiful in any one location; the best place seems to be the central one mile section, and 2 to 3 hours is enough to see all the main formations.